How long do crickets live? I've had this real creepy critter lurking on my front porch for at least three days now. It seems to be that time of year when they all start to think the inside of your house is more desirable than the outside of your house. These six legged fiends hide in the tiny crack near your door and your stoop, just waiting for you to unwittingly open the front door and let them in. There he is, every time I leave my house, looking up at me with those sad and insanely creepy insect eyes. I'd step on him and end this turmoil, but, in true Kristi fashion, I have this completely irrational fear of how this action might turn on me. What if I just barely miss squishing him, and, out of extreme anxiety, he maniacally hops up onto my leg. Then he crawls up my pant leg, and, in my complete panic, I'm unable to locate him anywhere in my clothing. So then I spend the rest of the day just waiting for the icky insect to reappear. Just when I let my guard down I feel a small tickle on the back of my neck. I absentmindedly brush at it with my hand - and BAM - there he is, again, touching my skin and sending me into cardiac arrest. I don't want anything like that to occur, so I mostly just shoo him away from a distance until it's safe to exit my home. 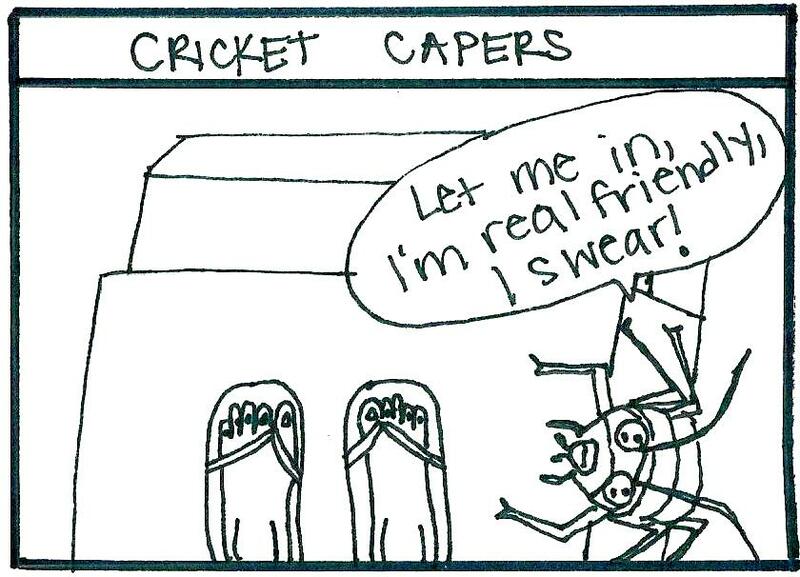 In related news, I think I may need to start drawing the bugs in my comics a little less realistically. I'm doing a bang up job of giving myself the heebie-jeebies every time I make one of these!